430 West Oneida Avenue, Bartlett, IL.| MLS# 10341003 | Parade of Homes Bartlett IL, Homes for Sale in Bartlett and the greater Schaumburg area. Listing commissions as low as 1%. Soo much to love here! 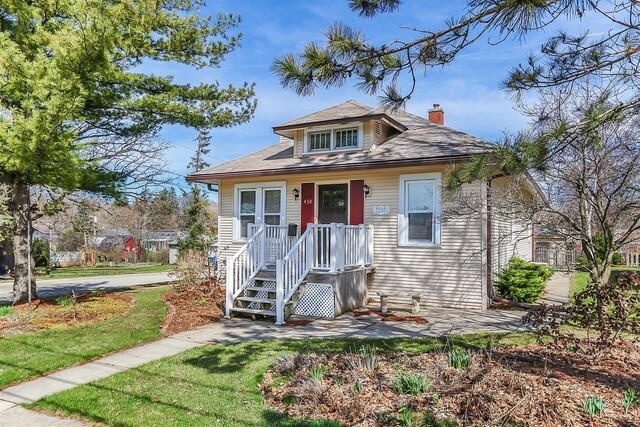 Beautifully maintained, landscaped (on the garden tour in 2017) and updated bungalow IN TOWN close to the train, park and schools. The Living Room has a Wood Burning Fireplace, built in Bookshelves, a Window Seat and opens to the sun filled Den with more built in Bookshelves. Remodeled in 2012 the Kitchen has tons of Cabinets, lots of Counter Space, a Breakfast Bar and a big Eating Area too! Extras include: Vinyl sided, Windows have been replaced, Wrought Iron Fence, Hardwood Floors, 9 ft plaster walls, remodeled Bathroom (2011), Gutters and Garage Door (2017). The yard is super deep and the 21x24 foot Garage has room for 2 cars, a Workbench and all your toys (motorcycles, snowmobiles, kids "stuff"). Clean and dry best describes the Basement (a sump pump and drain tiles were added in 2017). The 1/2 bath is a basement toilet (a sink is accessible).